(Mens XL) Mens Vintage 1970s polyester Disco Shirt. 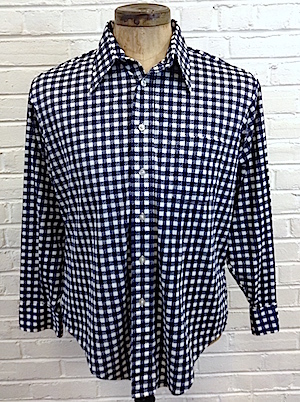 Navy & White Gingham! Home > 1970s Disco Clothing > 70's Vintage Disco Shirts > XL-2XL Mens Disco Shirts > (Mens XL) Mens Vintage 1970s polyester Disco Shirt. Navy & White Gingham! 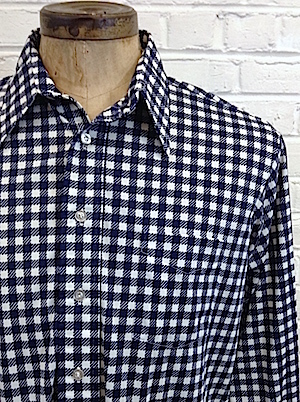 Vintage men's 1970s blue & white "gingham" polyester disco shirt. Dark white and white squares. Kinda makes my brain dizzy :) Long & pointy 70s collar. Left chest patch pocket. Tapered hem. Made by Career Club.